In the Autotrader grid, right-click in the row that contains the contract (and associated strategy) that you want to hedge. From the context menu, click Position Management. The Position Management window appears. You successfully opened the Position Management window. The Position Management window assists you in hedging your Autotrader positions outside of X_TRADER. 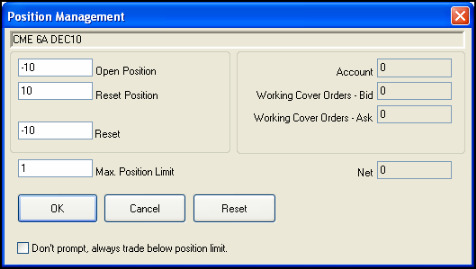 By including a ResetPos column in addition to the OpenPos (open position) column, you can separate positions that are at risk from positions that have been hedged. Additionally, Autotrader uses the Max. Position Limit field to monitor your position for a given instrument. Note: Whenever you hedge a quantity, it reduces your open position by the specified amount.